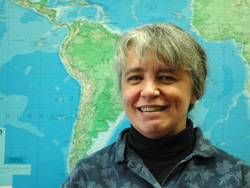 Susan Bauckus is a Senior Editor at the UCLA Center for World Languages and NHLRC. She is the managing editor of the Heritage Language Journal and was a co-editor of Heritage Language Education: A New Field Emerging (Routledge, 2008). She teaches Russian language at Santa Monica College and spends many hours tracking down language-related data on the U.S. Census Bureau website.